This is a straight re-issue of the original album “The Incredible Jazz Guitar of Wes Montgomery” except for two bonus tracks with slightly differing personnels. This was the third album issued under Wes Montgomery’s own name, he had previously recorded with his two brothers Buddy and Monk and they recorded as group under the title The Mastersounds. Wes Montgomery is renowned for his use of octaves on the guitar which is much in evidence on this album and gives his playing that extra dimension. Wes Montgomery’s own composition “D-Natural Blues” is one of the best tracks on the album with Tommy Flanagan taking the first solo and shows what a class player he is which is followed by a multi layered solo by Wes, a fine effort from all concerned. Wes Montgomery was a fine ballad player and “Polka Dots and Moonbeams” is one of his best and there is a gem of a piano solo by Tommy Flanagan. 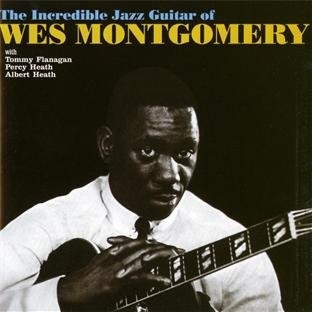 On “West Coast Blues” Wes Montgomery manages to cover all aspects of his skills and still leaves room for Tommy Flanagan to come up with another incisive solo. There is an inspired choice of tunes of tunes on this album and the group as a unit work well together with Percy Heath and Tootie Heath keeping things fluid. The first of the bonus tracks sees Wes re-united with his brothers on a rerun of “D-Natural Blues” which is another take on how to approach the tune and well worth inclusion on the album. Wes is joined by two horn men on another version of “West Coast Blues! Harold Land on tenor and Joe Gordon on trumpet who give some added weight to the number with taking interesting solos. If you are looking for a Wes Montgomery album to represent him in your collection this is as good as it gets.